Amerks Win Their First Game of the Year...The Hard Work Pays Off · Let's Go Amerks! 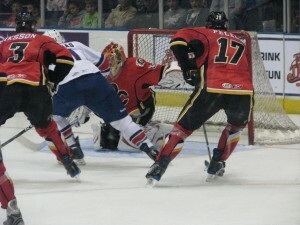 The Rochester Americans won their first game of the season tonight against the Quad City Flames in a 5-4 victory. Although the game really came down to the bitter end, the players put in 110% effort all night and their hard work finally payed off. The first period of the game, the players came out to play on both sides of the ice. Back and forth the puck went all period. No quality shots were taken by either team and the period ended 0-0. 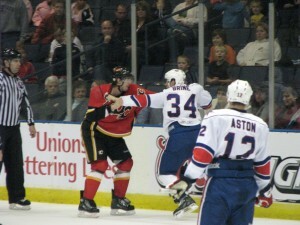 The Amerks were showing that they weren’t going to be taking the game lightly though. They were immediately giving out hard hits on the boards to anyone, no matter what the size of the player. The Flames got on the board first in the second period. The Amerks wouldn’t stand for that for long though. Shawn Matthias finally got his first goal he has been searching for. I’m glad he got it because he has been working so hard for it and seemed to be getting down on himself about not having a point yet. Only 20 seconds later, Drew Larman scored his first goal of the season. The Flames couldn’t let the period end with the Amerks leading, David Van der Gulik scored his first goal of the season, tying the game up 2-2 going into the third period. For nearly half of the third period the score remained 2-2 until Mike Duco scored his first professional goal at 8:44. The FLames tied it up again pretty quickly making the score 3-3. That was the last time they would have a glimpse at the lead again. McArdle scored his first goal of the season at 12:46 with assists from Larman and Glass. That line seems to be working very well together (combining for 2 goals and 4 assists tonight) and I hope they get to stay together to keep improving and show people what they are made of. At 16:17 of the third period, Matt Pelech cross-checked Jacob Micflikier behind the Amerks’ net. David Brine was not happy that his smaller teammate was layed out like that. He immediately went after Pelech even though Brine is two inches shorter and weighs a lot less. Brine may have gotten clobbered, but it is nice to see that this team really cares about each other and is willing to fight no matter who they are to protect their linemates. Pelech was sent to the box for 2 minutes for cross-checking and both he and Brine were done for the rest of the game with their 5 minute majors for fighting. During the last powerplay for the Amerks, Karl Stewart got his second goal of the season making the game 5-3. There was a little bit of nail-biting that took place before the end of the game when the Flames pulled their goalie and scored with only a little over a minute left to play in the game making it 5-4. 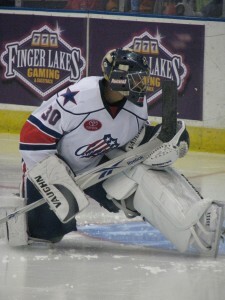 But, the Amerks held them off for the rest of the game and were extreemly pleased with their win. And who wasn’t? Although the crowd wasn’t as big as I would have liked to have seen, when the buzzer went off at the end of the game, you would have thought the Amerks just won a game 7. It was nice to hear fans happy and my voice is going to be gone for a few days I’m sure. 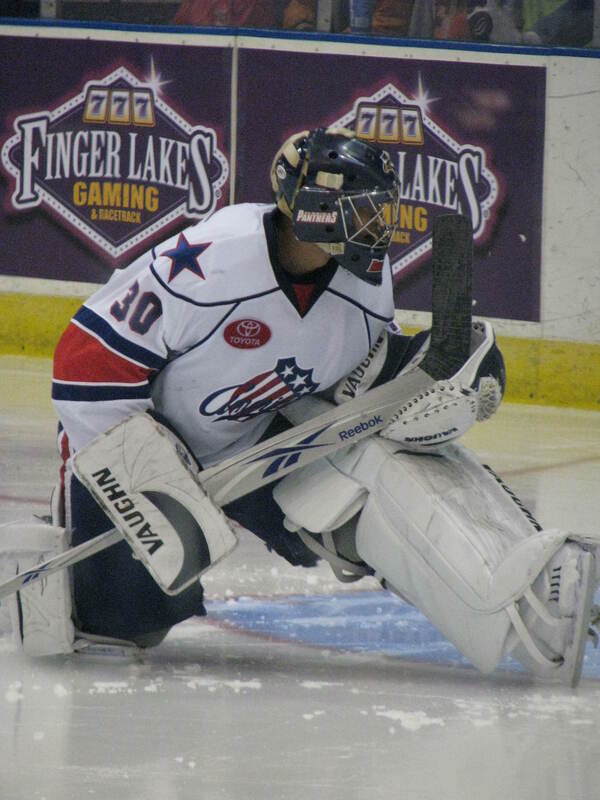 Chris Beckford-Tseu was in goal for the Amerks tonight. And while people might think giving up 4 goals was a bad game for him we all need to remember that the Flames had 40 shots while the Amerks only took 24. So, his save percentage wasn’t as bad as I’m sure everyone is worrying about. If the Amerks’ defense can hold the opposing team to less shots, the score will go down. And hopefully wirh lines starting to gel together well, we will continue to score more goals. And when Meyer gets back in the game, I think that first line is only going to improve. Improvements? The penalty kill. The Flames were 0 for 5 on their powerplay attempts. And the plays being run be the PK lines were identical to the ones being run in practice on Thursday. So, all of us fans owe Benoit a big thanks for stopping the not so hot looking special teams. Or leave the first line Repik – Sprukts – Matthias since they seem to be playing well together and put Meyer as he head of the second line. Spread out the wealth. I am really hoping to be able to make it to the Syracuse game tomorrow. I want to see Emmerson in the game fighting Mirasty (or anyone for that matter). I want to see what he is made of and I’m sure everyone else agrees. He did warm up witht he team tonight before the game, but when there wasn’t anyone there to fight him on the Flames, he was quickly scratched in lue of someone who has a better chance of scoring a goal. Remember to listen to the game tomorrow. The Amerks are traveling to Syracuse for their second of three games this weekend. The game starts at 7:30pm. You can also watch the game on AHL live for a small fee.